As a frequent party hostess, I really believe that “hospitality” can truly be a wonderful way to express how much your guests mean to you by the effort you put into your events. Washington Irving has said that “Christmas is the season for kindling the fire of hospitality.” For a lot of folks, this may be the only time of the year that you entertain. Remember, hospitality can be infectious and inspire others to do the same for their friends and family. Choosing tableware with a more formal feel is a big part of dressing up a Christmas table setting. However, it does not have to be expensive!! For example, these round copper placemats were purchased from Big Lots (from their fall collection) and were only $2.50 each! More details below on how I created the place settings. As you can see, my three dining room chandeliers are quite formal, so adding a lot of glass to the table works very nicely and provides a lot of impact. Then, it is just a matter of adding in the details that tie everything together. This is where all the fun begins! For the centerpiece, I started with a mixture of cylinder glass vases and the large birch logs. I purchased these logs from CB2’s website, but they are available from a lot of vendors. Initially, I started with these for several reasons…height, drama, the rustic look and the awesome texture they add! For the filler in the vases, I added a variety of sizes of real pine cones. The tiny ones are my favorite (from Hobby Lobby and super inexpensive!). Next, I placed the decorated faux garland (with “snow” and pine cones included). To continue the theme, I filled other smaller cylinder glass vases with a variety of pine cones. A lot of them came straight from my yard! To wrap things up for the centerpiece, I added in the coordinating cylinder candle holders. You could really use any assortment of candle holders here as long as they are tall enough to clear the height of the garland. Finally, the large glass balls, fancy ornaments, and mercury glass votive holders completed the look. Always use the theme of your Christmas decorations to direct the selections for the place settings. Here, I chose the copper placemats to tie in the warm tones of all of the pine cones. Similarly, the napkin colors and textures coordinated with the faux greenery. The snowflake napkin rings and plates were a great option for the winter look of the table. The silver, lacy salad plates were the “topper” for me, finding them at TJ Maxx for $2.99 each! I will certainly be using them for my New’s Year Eve table setting (more on that coming up!). For the glassware, I always recommend using a variety of colors and styles to add to the character of the table setting. The champagne glasses were my grandmother’s and I love using them for occasions such as this. Years ago, I purchased the gold water goblets from an antique store and they really add a lot of elegance to the table. The grey wine glasses are from Cost Plus and you will most certainly see them in future posts! They are very versatile. For the rest of the room, I continued with the glamorous winter theme. If you know me at all, you know I am obsessed with Christmas trees and decorating them in a variety of themes and colors. In another upcoming Christmas Home Tour, I will feature all of our trees for this year. Stay tuned for that! 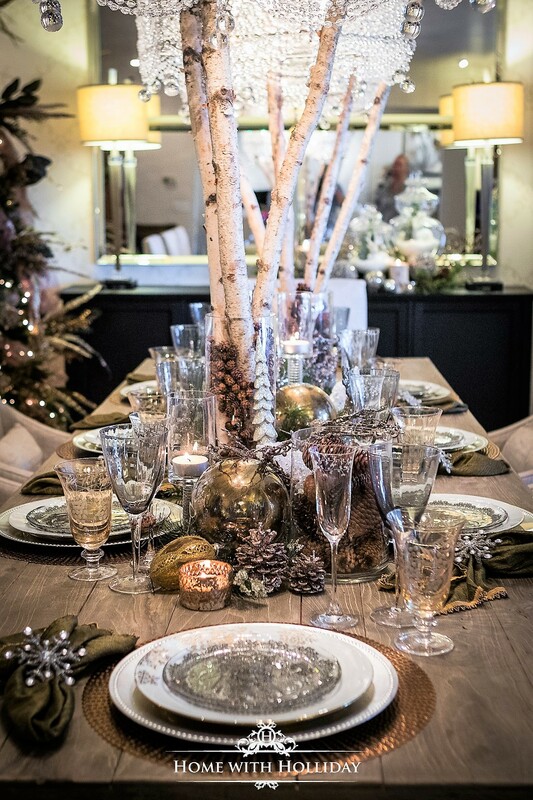 Feathers, pine cones (real and decorative), a mixture of gold, copper and silver ornaments created this warm, coordinated glamorous, rustic winter design. To see the details on how I put together the decor on my buffet using apothecary jars, click here. It is super cute and so easy to do! If you link to the blog post, you can also shop the design. Finally, I have a great bay window in my dining room and I love decorating it for each season or holiday. It is a favorite spot for our sweet doberman to sit and protect us from all the squirrels in our front yard. Here, I chose a cream fringed throw and pillows that coordinate with the rest of the decor. Adding in the black marble tray offered a great landing spot for fresh flowers (arrangement by me! ), candles and a few more pretty ornaments. Here is the final shot of the whole room. Hopefully, this gets you in the spirit for creating a beautiful table setting! My future Christmas Home Tour posts will include my living room decor, kitchen, and breakfast room decor, basement decorations, my Christmas trees, and some gift wrapping inspirations. Thank you for stopping by during this very busy time of year! If you would like to see the details of the other Christmas Home Tour posts, click on these links below. In these posts, there are links to shop some of the looks I have shared and see the details of how the designs were created. Absolutely gorgeous!! Thanks for the inspiration 🙂 Merry Christmas! Thank you so much Emily! Merry Christmas to you too!